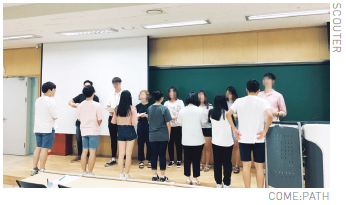 The University of Seoul (UOS) official admission honorary ambassador, SCOUTER, held a mentoring program “COME:PATH” on July 14. The title means they help students to find the right way. It aims to give the right information about the UOS entrance examination and motivate mentees to enter our college. They recruited mentee students through their Facebook page and Kakao-talk plus friend, “pathfinder”. Lastly, they received applications through their own websites. Mentors, who are students of various departments, were made up of acquaintances of SCOUTER members. The program was organized in five steps. First, mentees and mentors watched the freshman interview video about college acceptance. And then, the SCOUTER leader explained UOS entrance examination with their presentation ppt. The explanation contained a lot of information; such as history of UOS, established departments, admission process, schedule, last year's admission status in the last year, and tuition. Next, they conduct mentoring programs between mentors and mentees. Lunch was served at this time, so mentors and mentees ate together and could talk in the casual mood, which lasted about one hour and half. After that each team did a campus tour under the guidance of the SCOUTER. Mentees looked around the building of the department they wanted to enter. Lastly after coming back from the campus tour, they had times for questioning and answering the enrollment of UOS with mentors and mentees. After the mentoring program, SCOUTER received a review of the program and made efforts to improve it. According to the reviews, most students who participated in the program were satisfied with it, said SCOUTER leader. Students who are interested in this program can get information on the SCOUTER Facebook page or their website (bit.ly/2MfMCbj).